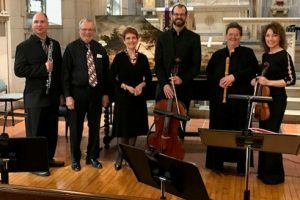 Join us for a fun concert featuring the music of George Frideric Handel and Johann Sebastian Bach. These world famous composers were both born in 1685, approximately 80 miles apart, yet never met one another. Their monumental contributions to the world of music continue to influence composers today. The program includes the Overture to the opera Tolomeo, arranged for solo harpsichord. Sometime during the year 1707, while Handel was in his 20’s studying in Italy he composed the solo vocal Cantata, Nell dolce dell’oblio (In sweet sleep’s oblivion), a dramatic work for soprano. Also on the program will be the sonata, Sonata in C minor, HWV 386a. The music of Bach will include the Suite for Unaccompanied Cello in G Major, BWV 1008, the Sinfonia and aria Seufzer, Tränen, Kummer, Not (Sighs, Tears, Anguish, Trouble), from Cantata BWV 21, and the joyful aria from Cantata BWV 69, Mein Gläubiges Herze (My Faithful Heart).